Pick any phase of underworld life in the second half of the twentieth century – the coke spoon disco years of New York in the 1970s, the Miami mayhem of the ‘80s, the spread of cartels around the globe and into politics in the ‘90s – and Jon Roberts was involved. 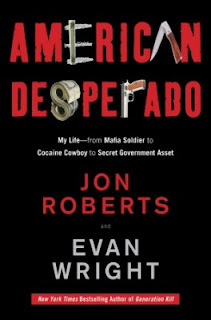 Already featured in the documentary Cocaine Cowboys, Roberts gets the sprawling, punishing epic he deserves in American Desperado. Co-author Evan Wright also wrote Generation Kill, one of the best books about the Iraq war. Here he makes the shrewd decision to stay out of Roberts’ way and let him explain how a New York street punk ended up the primary U.S. associate of the Medellin cartel and eventually a CIA asset. Wright remains an active presence in the footnotes, vetting Roberts’ every word, pointing out which claims he can’t verify, citing chapter and verse on those he can. Roberts, who died late last year, is honest to the point of being unnerving. He tells Wright in an early meeting, “I might be a sociopath. Most of the time I’ve been on this earth I’ve had no regard for human life. That’s been the key to my success.” He genuinely believes in the philosophy he learned from his wiseguy father: evil is stronger than good. Even the funny stories – like accidentally getting Ed Sullivan high on LSD, or the time one of the world’s great jockeys was almost mauled by Roberts’ pet cougar – have a sinister edge, and throughout the book Roberts offers grimly practical advice on a host of dark subjects, like a Heloise from Hell. When fighting, use gravity to your advantage and “no matter what, always be kicking his balls.” Roberts’ technique for disposing of a corpse has a brutal elegance worthy of Martha Stewart. Desperado is over five hundred pages long, all of them disturbing and compulsively readable. It’s also spawned an even more alarming follow-up. Roberts openly admitted to helping dispose of the gun used to murder Meyer Lansky’s stepson in 1977. His more astonishing declaration: the triggerman, an enforcer for a Miami drug kingpin, became a CIA officer. Wright digs into the accusation in the ebook How to Get Away with Murder in America and turns up one shocker after another about an alleged underworld hit man turned counterterrorism expert who currently has ties to Mitt Romney’s presidential campaign. The story and Wright’s through reportage beggar the imagination. Wright summarized his findings for the Daily Beast.